According to the American Cancer Society, more than 268,000 women in the United States will be diagnosed with invasive breast cancer each year, with more than 41,500 American women dying from the disease. Breast cancer is the most common form of cancer among women in this country other than skin cancer, and is the second leading cause of cancer death in the nation, following lung cancer. In recent years, the death rate among women diagnosed with breast cancer has been steadily declining, which is probably the result of earlier detection and better treatment methods. Regular screenings to help detect breast cancer in its earliest stages, when it is most treatable, are among the most effective methods for women to increase their chance of surviving the disease. That's why doctors recommend that women begin monthly self-exams and regular clinical breast exams at age 20, and annual mammograms starting at age 40. With digital mammography, doctors can get a clearer image that can help them spot masses as small as a grain of rice. The Breast Care Center at Summerlin Hospital Medical Center offers a comprehensive slate of screening and diagnostic services. Summerlin Hospital offers 3D mammography technology (also known as tomosynthesis), which produces a three-dimensional image of the breast tissue with approximately 300 images, thereby enabling the radiologist to scroll through multiple images. 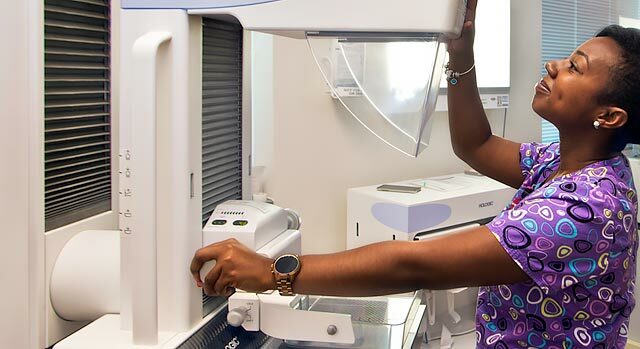 3D mammography helps radiologists better understand the breast tissue, identify cancers missed with 2D mammography, and reduce the need for follow-up screening because the physician can see the breast tissue more clearly. The Breast Care Center also features the SmartCurve™ breast stabilization system on its mammography machine, which distributes pressure more evenly over the breast to reduce pinching and increase comfort during the mammogram. 2D mammography, which typically provides four images, is also available. To schedule your annual screening mammogram at the Breast Care Center at Summerlin Hospital, call 702-233-7337. Ultrasound imaging is a noninvasive medical test that can produce an image of the internal structures of the breast to help physicians diagnose and treat medical conditions. A stereotactic biopsy may be used when a physician cannot feel the lump that was found on a mammogram. Doctors use mammographic images and computer technology and combine them to determine the exact location of an abnormality to obtain a sample of breast tissue through the use of a long needle. A pathologist then examines the tissue sample to make a diagnosis. It is best to schedule your mammogram for 7 to 10 days after menstruation begins. Bring your previous mammogram films or ask that they be sent to the Breast Care Center at Summerlin Hospital Medical Center so they can be compared to the new images. On the day of your mammogram, do not wear deodorant or powder on your breasts or in the underarm area. Such substances can cause artifacts on the image, making it necessary to repeat the mammogram. The technologist must compress your breasts in order to visualize the internal structures properly. Return to the Breast Care Center at Summerlin Hospital for your next digital mammogram, so your new images can be compared more quickly and accurately to your previous ones.